My primary purpose and approach with this test deviates somewhat from previous evaluations of recently fielded detectors. 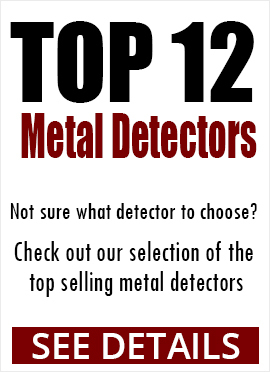 The AT Pro has long been one of the best if not the best selling metal detector on the market today for both those new to the hobby and those with years of experience swinging a coil. A routine field test, similar to those I've done in the recent past, is therefore unnecessary. However, for the new detectorist, there is a need to understand the different purpose, tones and advantages between the Standard and Pro search modes. I'll focus on these search modes throughout the report with particular emphasis on the Pro Mode. Overview : The AT Pro offers 3 discrimination patterns within each of the two major search modes of Standard (STD) and Pro (PRO) providing the user with a choice of Custom, Coins (Coins and Jewelry) and Zero (All Metal) for a total of 6 options. Generally speaking, the STD mode is better suited to the new user—those just learning the AT Pro. It's the simplest being engineered to give only a binary signal—a standard strength tone when a target is detected regardless of size or depth. The STD mode gives a low tone for non-conductive material, a high tone for conductive material and a mid range tone for those other materials in between. The tones are either on or off—simpler but less target information. This mode is the quieter of the two i.e. less tones and less tonal variation, thus it's easier for the new user to grasp. Garrett refers to this as Binary Audio. The PRO mode is better suited to the somewhat more experienced detectorist and those wanting specific target information. The signal response in the PRO mode is proportional in that it responds differently depending on target type, depth, conductivity and proximity to the target. For example, shallow targets will be heard by a strong signal while the deeper the target, the softer will be the tone. The AT Pro also reports a “tone roll” as Garret describes it depending on the conductivity of the specific target such as bottle caps compared to coins which enables the detectorist to better identify it and pass up junk targets if he chooses. Garrett refers to this as Proportional Audio. Although I found both modes very easy to operate, I would suggest the brand new detectorist begin in the STD mode until comfortable and then experiment with the PRO mode as their proficiency increases. My guess is that proficiency level will increase very rapidly. STD vs PRO Mode : The table below is a side by side comparison of the major attributes. My first test was conducted in sandy soil at a variety of sensitivity levels using auto ground balance. The results were impressive in both STD and PRO. In sensitivity level 8, the AT Pro detected and correctly identified the target at depths of 9-11” in both Coins and Zero search modes. Lower sensitivity levels resulted in the expected shallower detection depths with accurate target identification suffering only a little. The depth scale itself, displayed in 2 inch increments, appeared accurate within those range bands. The AT Pro's ability to recover quickly from target to target is acceptable in STD but noticeably faster in the PRO Mode. The separation and discrimination capability is very good in the PRO mode and provides faster recovery than in the STD mode. It simply gives the user much more information regarding target type and the number of targets as the coil is swept over a combination of ferrous and non ferrous targets. While the STD mode sounds off with one signal over closely positioned multiple targets, the PRO mode provides distinctly different and multiple tones over those same targets. I much preferred the PRO mode option. I next ran the AT Pro on a local fresh water trashy beach and found no discernible difference between it and land. The AT Pro operates just as well in terms of depth, sensitivity, stability and target separation especially in the PRO mode. The enhanced recovery speed and related separation capability when operating in the PRO mode was impressive as I was able to continually distinguish between ferrous and non ferrous targets. Not surprisingly, this detector was just as stable and effective in the fresh water lake as it was on the fresh water beach itself. Once again, the stability was ground balance dependent. Finally, I took the AT Pro to one of our saltwater beaches of central Florida. The detector performed on our beaches exactly as shown in the Garrett videos—stable and effective. As dedicated users already know, this detector can be stabilized sufficiently to run very well in saltwater environments. An operational “sweet spot” can be achieved with proper ground balance and sensitivity settings in either STD or PRO mode. Note: I found a solid ground balance must be established before setting the sensitivity level in order for me to reach an optimal level of performance. On the saltwater beach especially, I preferred to manually ground balance so as to more precisely and quickly achieve stability. I was then able to easily find the right sensitivity setting that allowed me to search productively in dry and wet sand as well as the surf. In the dry sand, I was able to run in a very stable manner and detect my target quarter at greater depths in the PRO mode than in STD mode. In PRO mode, I was just able to pick up a quiet tone on my target at depths between 12 and 14 inches but with no accurate identification. At the 8-9 inch level, the AT Pro solidly identified the target as a quarter every time. In the STD mode, the detection depth was somewhat shallower but the identification level was the same at around 8-9 inches. Shallower ferrous targets could clearly be identified by both the distinctive tone and identification scale. In the wet sand and surf, again I was able to stabilize the AT Pro through a combination of proper ground balance and sensitivity levels. Although running very quietly, I noticed both depth and identification capability somewhat degraded in the mineralized salt and surf. I was still able to detect my target quarter at depths of approximately 8-9 inches in the PRO mode using Zero discrimination and about 6-7 inches in Coins. Accurate target identification did suffer a bit however. I soon found that target identification in PRO mode to be better using strictly tonal differentiation than relying on the visual scale of the display. This, of course, takes practice and time to learn the PRO mode language and interpret what it's telling you. Again, these results were on my particular test beach. Results in other areas may differ. Common to all environments however will be the need to properly maintain ground balance when moving into or between new areas. If this is done in conjunction with sensitivity adjustments, pleasant surprises await. Unboxing and Assembly : Excellent instructions and very simple to follow. Even a first time detectorist will be able to successfully assemble and put the AT Pro into operation and do so very quickly. Explanation of Capabilities and Function : Garrett publishes a first class user manual and produces an excellent instructional video series that covers the AT Pro in detail. I highly suggest new users watch all 4 segments of that video. Part 2 however is the one that deals specifically with our subject at hand—STD vs PRO mode. Control Panel and Operation : The controls and operation used in the two search modes is push button easy as are all selection options on the AT Pro. The new user will have no problem picking up the control panel operation regardless of which mode, STD or PRO is selected. Again, the instructional videos are a gold mine of information and very highly recommended. Weight, Water and Weather : At 3.03 lbs, the AT Pro is easy to swing and adequately balanced. As most are already aware, the ATP is water proof to 10 feet and therefore obviously impervious to the effects of weather and dirt. Even if you never intend to take this into the water, you won't have to worry again about being caught in a sudden rain and having a damaged control box as a result. I love this in all my machines. Target ID and Depth Scale : The ability to properly identify the target I found to be excellent when the target is of reasonable size and doesn't exceed detectable depths. The depth scale is registered in ranges of 2 inch increments. I found the AT Pro accurate at providing an idea of depth within the detectable depth limits... it is not designed to provide a precise measurement down to the inch level of resolution. Stability, Sensitivity and Discrimination : A very stable platform in most environments. The sensitivity and discrimination capability is noticeably enhanced when operating in the PRO mode which provides more tonal information into the number, type and depth of the targets. Operating Modes : The 6 search patterns available in the two search modes provides the detectorist with a very good span of possibilities. The AT Pro can be made to operate very simply or can be tailored to give more detail as desired. The Custom option in either STD or PRO mode allows the user to personally tailor as well as retain the custom discrimination setting even after shutting down the detector. You can also customize the discrimination profile in Coins and Zero but when the machine is turned off, it reverts to the factory settings in those two particular search patterns—all of which translates into a wide range of flexibility. I really liked that! Chatter : With proper ground balance coupled with the appropriate sensitivity level, the AT Pro can virtually eliminate chatter...obviously results will vary depending on the amount of mineralization in the sand or soil. Frequency Shift : The AT Pro provides the capability to make minor shifts in the operating frequency to any of 4 choices eliminating/reducing electrical interference and thus counteract EMI induced chatter. Cable Connector : My one minor complaint concerns the proprietary design of the coil and headphone connector. Perhaps it was just me being 67 years old, but I found getting the proper alignment of the micro sized pins with the micro sized holes more difficult and cumbersome than it really needed to be. Additionally, the plugs are so far tucked into the housing that along with ensuring proper alignment, pushing the connector in sufficiently to ensure a solid waterproof seal and tightening down the collar, this procedure can be a little tricky for larger fingers. Why Garrett didn't just simply use a standard waterproof plug-in connector is beyond me. However, given all the many positives with this machine, I'll happily take on the connector challenge until a new design is fielded! Of all the detectors in this class I've thus far tested the AT Pro seems to have it all—simple to use yet flexible, effective on land and the beach, optional coils, waterproof and reliable. While the STD mode may be the best for beginners initially, I found the PRO mode to be exceptionally easy to operate and master. It gives the user more detailed information and although it takes a little time to learn the tones of what's lying under the coil, don't let that scare you off. Yes, start with the STD mode, practice on a variety of targets and experiment with the PRO mode until you feel comfortable. You'll quickly develop a high level of respect for the PRO mode and will rapidly come to appreciate how accurate it can be at identifying targets by its various sounds. Keep in mind, maintaining a good ground balance coupled with the appropriate sensitivity level will pay big dividends in the field regardless of the particular environment...be it land, fresh or saltwater beach and surf. Although the AT Pro ground balance procedure isn't as automatic as the Ace 350, it's still very easy to operate and quickly master. One suggestion to consider; build yourself a test garden using a variety of target types, buried at various levels and practice, practice, practice. I'm sure you'll find you can learn what this detector is telling you in short order and the more you practice, the shorter will be that order! All in all, the AT Pro is the closest detector to being an all around champion that I've tested thus far. In fact, I bought one for my son as his first detector and have one of my own for visitors, family and friends to use when they come to Florida...of course only when I'm not using it! Just the view from my foxhole...your results may differ depending on the operating environment.